Students can perform simulated experiments on tectonic forces, minerals and rocks, and scientific inquiry. Once they’ve completed the experiments they can move to the assessment component for writing or data analysis activities. 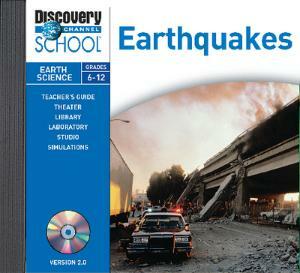 Closed-captioned videos include the San Andreas Fault; the Himalayan earthquake zone; measuring, monitoring, and predicting earthquakes; and earthquake-proofing. They can also create their own multimedia presentations with the wide variety of information included on this software. A printable teacher’s guide is also included on the CD. System RequirementsMac: PowerPC, OS 8.2 to OS X, 32MB RAMWindows: Pentium processor, Windows 95/98/NT/2000/XP, 32MB RAM.